It uses a single sided copper coated board as a ground plane, and you cut up a second board into insulated pads. You super glue the pads to the board to match the schematic, and solder components and wires between pads. Anytime a component connects to ground you solder it to the ground plane. Given that this was on a Ham radio site I imagine the technique must be to mitigate RF noise. The build then uses through hole components as if they were surface mount devices and solders them to the pad. Again this was a Ham radio site so the large ground plane is probably a noise management strategy. Neat ideas, particularly for RF. 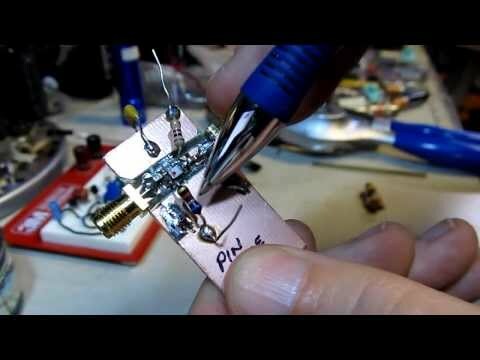 Reminds me a bit of another technique that was used with logic and RF circuits. 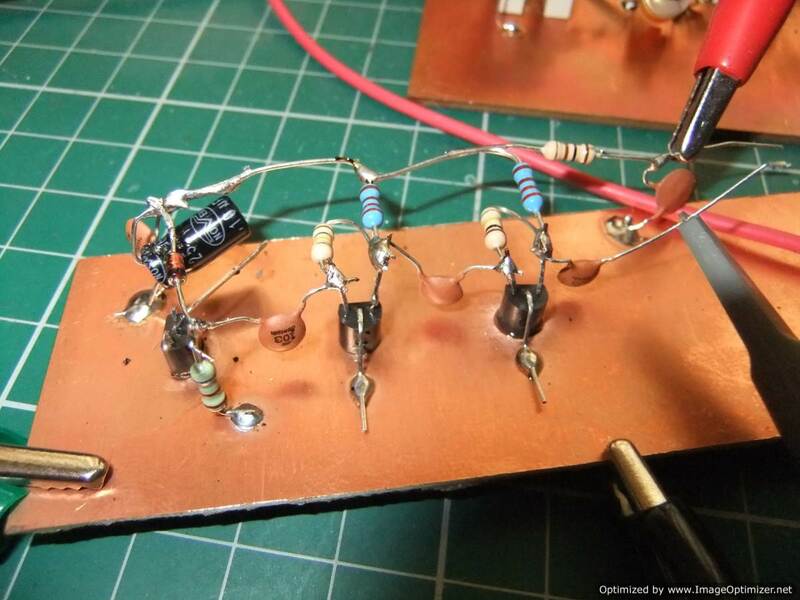 The IC's were glued to a copper clad board with the leads sticking up and the signals were connected with passive components, soldered wires, or wire wrap. Hey, that Manhattan style build looks dead neat. It's basically what we did with tubes back in the days. The aluminium chassis was the ground plane. Components were connected either to ground or connections on ceramic stand offs, or strip boards. The transistor/chip version of that was "dead bug" prototyping. Glue the chips and such to the copper ground plane upside down then hook up the connections. Saves needing those little breakout boards for the DIP chips. The Pittsburg style looks like what we used to do back in school in the 1970's. Good stuff. Thanks for the memory jog Heater. I could remember how it was done but just could not recall what it was called. A bit embarrassing considering how much a chip with the pins in the air looks like a dead bug. 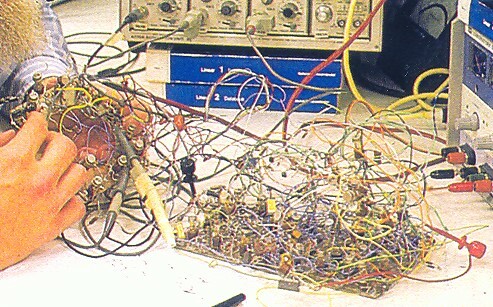 It could be a rats nest like that, but it could also be pretty neat if wire wrapping was done using brass finishing nails as guide posts to channel the wires. Wasn't it Zenith that advertised a hand wired chassis is better than a circuit board, they we're just to cheap to retool. Back then it was probably true. PCBs in that era were single-sided and made from Bakelite, a brittle, brown proto-plastic composite. I'm sure that cracked traces and pad separation were not uncommon. I repaired a number of GE sets with early double sided boards that had soldered rivets instead of plated through holes. They were such a common failure mode that there was a hotline you could call that would tell you what points to add jumpers between to fix common issues. OMG, I thought my bench got pretty bad between cleanups! I remember working in a tv shop in the mid 70s, my job was to remove the back of the set and take a vacuum to the inside, make sure to catch all the litte critters that called it home, then had to check each tube in a checker, and clean control's. If that didn't fix it, we would have to dig deeper in to the chassis, with the guidance of the boss and a Sam's circuit diagram, Brown and burnt bakelite, from heat, current, high voltages, dust and roaches. Those soldered rivet or wire wrapped conection's were a big problem. Would the Manhattan / dead bug method work using aluminium? For example, old cook pots, pie tins, or aluminium clad foam core board? This looks really handy. You won't be able to solder to aluminium. You'd have to screw solder tags down to it for ground connections. Like we did when building chassis for tube circuits. Hard work but doable. Maybe copper plate it first? Here's a YouTube tutorial on PCB making with a focus on the Pittsburgh style, although he calls it the Muppet style. He briefly mentions Manhattan style and through hole, but then explains why he prefers this technique. I like the Manhattan idea as it saves doing any etching. No designing of trace layout, just slap pads and components down as the circuit and component shapes/sizes dictate. Perhaps better suited for one off prototyping. If you want to make many boards looks like Pittsburgh might be less work. One major difference between the two is that Manhattan gives you a continuous solid ground plane where as Pittsburgh makes spaghetti of of your ground plane. That might be significant when dealing with high currents or high frequencies. The solid ground plane helps isolate boards if they are stacked nearby each other. Any PCB layout gurus like to comment on that? My issue with PCB etching is that I tend to build one offs. So the investment in PCB layout and etching never pays off versus the faster, neater construction. So I tend towards perf board or veroboard construction. Both work, but I often find hotspot nodes in the circuit where I want to make a lot of connections, so I have spaghetti wires running from all over towards these nodes. Power and ground rails help reduce some of the cross board clutter, but towards the end of construction I can find myself struggling to manage the complexity of the interconnections. I guess I don't see what's special about this Pittsburgh/Muppet style. People have been making boards by routing or milling out insulators for a long time. I guess using through hole parts as surface mount is what makes it different. I made a power supply back in the 80s using a dremel tool to separate copper areas and form the circuit. I did drill holes for the parts though. I've also used a glass hole drill to create pads on the copper for use with point to point wiring. For sure all of these techniques have been in use since whenever it was we could get hold of copper clad board. I remember our little nerdy group in school lashing things up in many and varied ways back in the 1970's. Never knew people had taken the trouble to put names to these things. My first PCB layout, for my TTL and Nixie clock, was scribbled by hand on the board with an etch resist pen and dropped into a dish of conc. sulphuric acid. Let's just say that it etched rather quickly. Fastest turn around for a board I have ever seen! @Rick, thanks for the link to that video. I think a combination of Manhattan with sky wiring might be what I am looking for. It seems like it can produce a robust circuit, but integrates the design and assembly phase for one offs. Very nice. All those methods require some actual planning, though. I'm a staunch supporter of the "Serendipity" and "stream of consciousness" style of prototyping. I solder a microcontroller socket in the middle of a probably big-enough protoboard, and attach support components spiraling outward, hoping for the best. I strive to get the big chunks in place (switches and connectors), then tune for minimum smoke. @Tom, it was a video of David Richards amazing radios that got me started learning about this technique. 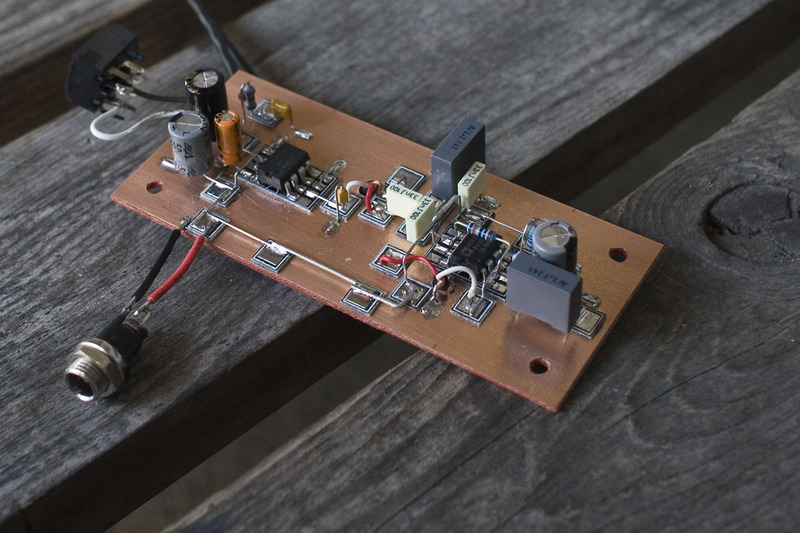 His Sproutie MK II with multiple op amp filters is a work of art.